Come in for good food and good fun! Monsarrat Avenue, located near Diamond Head, is an up-and-coming area, where clusters of eateries can be found along this street. But the restaurant that steals the plate when it comes to local eats is Pioneer Saloon. At this eatery, everything is served in a classic, plate-lunch style. Customers will recognize the familiar allocation of food: a large portion of protein and a heaping side of rice. What they won’t expect is the different flavors of rice, including mixed bean or nori. The variety of food is what distinguishes this place from other plate lunch spots. With options, such as garlic ahi with wasabi mayonnaise and brown rice or Thai chicken and shiso rice, delectable combinations are endless. The eclectic Western theme that sets the ambiance at Pioneer seems a bit out of place for this surf town, but owner and chef Nori Sakamoto says it’s just his personal preference. “There’s no reason; I just like it,” said Sakamoto, in an interview with Honolulu Magazine. The quirky collection of clay figurines, driftwood frames and succulents creates a welcoming and casual atmosphere. This eatery is not one that puts pressure on its diners either. All are welcomed; no matter if they’re in work suits or swimsuits. My advice: come for dinner instead of lunch. The crowds tend to flock in during lunch to escape the oppressive heat. As an added bonus, customers can also visit Pioneer’s sister store Ars Cafe, also located on Monsarrat Avenue, for a sweet gelato treat. 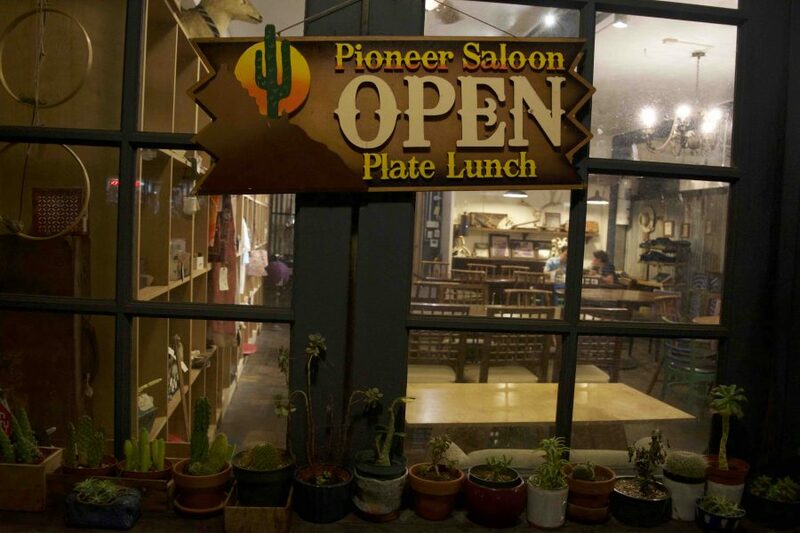 Pioneer Saloon is located at 3046 Monsarrat Ave., Honolulu, HI 96815. It is opened daily from 11 a.m. to 8 p.m.